As a teenager I built my first car before I could legally drive. 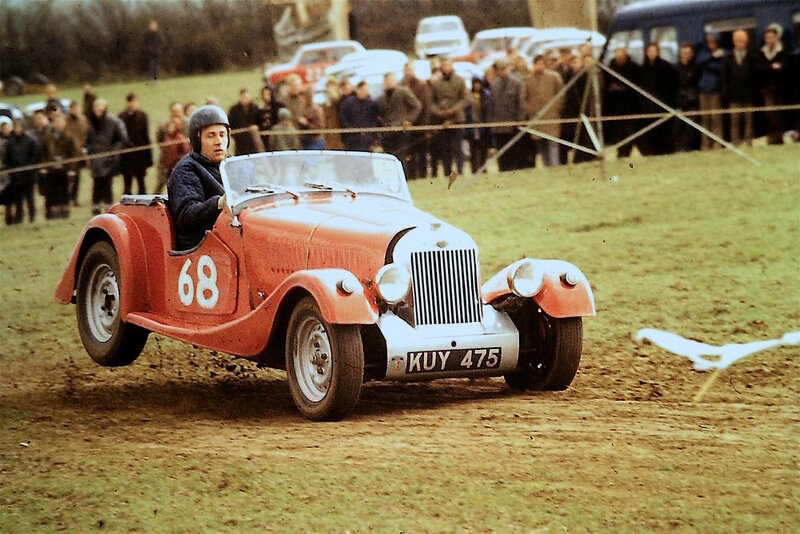 It was an Austin 7 Special and hit the road on the day I passed my test. Great fun. Taken in early 1960's. Still on the road today in Leicester. 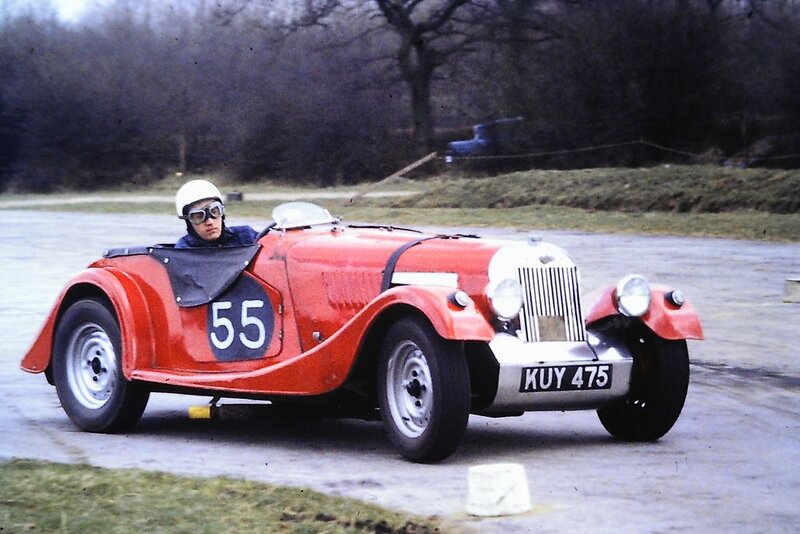 My 1952 Morgan +4 on its first outing at Mallory Park. Early race modified. Enjoying "proper" racing at Silverstone, mid 60's. The car has now been returned to it's original condition as supplied by Morgan Cars in 1952 by it's new owner. Again racing but to strict unmodified rules. Our First December Wedding of 2017. Dull weather lit up by a lovely couple. We travelled quite a good distance for yesterday's wedding. The Bride was picked up from Rothley Court for a pleasant drive to Nailstone Church, except we encountered a road closure at Cropston Reservoir. Oh dear! Luckily I have a good knowledge of the network of roads in the Charnwood Forest area and a quick detour via Swithland, ensured we arrived at the Church only a few minutes late. Victoria and Jonny enjoyed the few miles through a misty Copt Oak to the reception venue of Beaumanor Hall. Sam and Graham enjoying the confetti following a post wedding drive around Burbage Village. This happened to coincide with the children coming out of Sketchley Hill and Grove Road Schools. Good fun for them to see a Bride and Groom driving by in an open topped car! Rebecca and Peter arrive at Brownsover Hall, Rugby following our country drive through Monks Kirby and Pailton which allowed most of the guest to be waiting for our arrival. A lovely occasion for the happy couple. By the way the weather "window" closed 5mins after the Badsworth was back in the garage! Emily and Duncan enjoying their first married moments together following their Wedding in Lutterworth. We found a lovely country route through Easenhall and Brinklow for our journey to Coombe Abbey. The long approach drive to the Abbey is most impressive, especially when a welcome champagne toast is offered to the happy couple in the beautiful Courtyard on arrival! Katherine and Gavin pause for a toast and photos following their Wedding at St Peter's Church, Witherley Atherstone. The 2 mile drive to the Mythe Barn reception was perfect, with the hood down and lovely warm spring sun. A most enjoyable ocassion! Emma and Warren were Married at Christ Church Mountsorrel after travelling the short distance from Quorn Grange Hotel. Following the Wedding we drove up Castle Hill for some photos prior to returning to Quorn Grange for the reception. A sunny day which the couple enjoyed with the hood down for a slow drive in the open. This was the first time that I have driven to the rear of Quorn Grange Hotel. Great location for a photo. 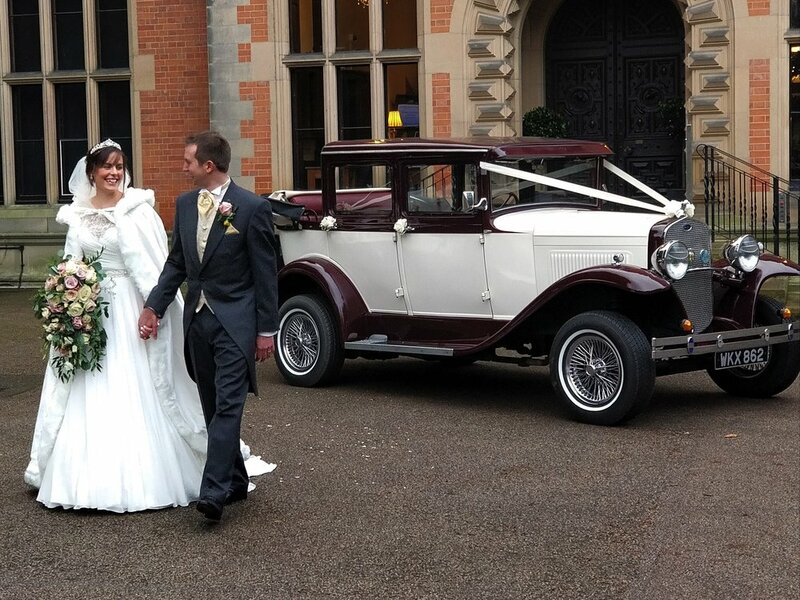 Our Badsworth was used for all 3 wedding plus the Beauford for last Saturdays. 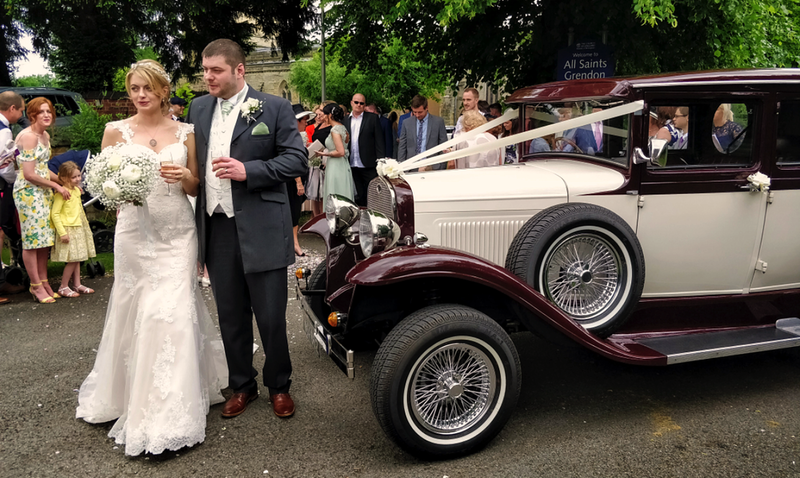 In addition to visiting St. Catherine's Church in the heart of Burbage it was our pleasure to chauffeur our newly married couples to 3 renowned nearby reception venues. First reception was at Ashton Lodge in the hamlet of Street Ashton via a very quiet lane through Monks Kirby. A lovely extra few minutes drive for the happy couple. Our second wedding was potentially a very short distance to Sketchley Grange Hotel in Burbage. We diverted via Aston Flamville stopping for a few photos of the Bride and Groom. Last Saturday the wedding party were picked up from Ansty Hall nr. Coventry making use of both the Badsworth and Beauford. As is often the case for the journey from Church to reception we made a detour to allow guests to arrive prior to the couple. This time a drive through Withybrook and along the narrow lane to Shilton was ideal for Tessa and Christopher to enjoy a few quiet moments together before arrival At Ansty Hall. Although we experienced a little rain our arrival at Ansty Hall was dry and perfect for a photo of Tessa and Chris looking so pleased to be married! Michelle and Adam escape storm Doris! A wedding on Friday the 24th February was a decision well made by Michelle and Adam. Thursday was the weather "bomb" of Doris and today (Saturday) a return to wet and windy conditions. Friday was great with light winds and plenty of sun. We even lowered the hood for a few yards on the Badsworth. The couple are from my home village of Burbage so very short drives to the home and St Catherine's Church for the marriage ceremony. The reception was held at Ashton Lodge Country House which can be reached via quiet lanes through Aston Flamville, Sharnford and Monks Kirby - we hardly met another car. A special wedding for us to start our 2017 season. Many congratulations to Michelle and Adam.